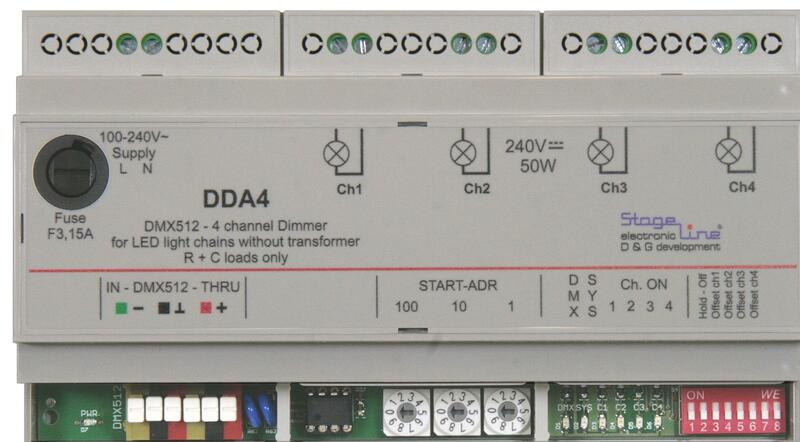 The DDA4 is a DIN-Rail mounted and DMX512 controlled 4 channel dimmer. It is especially designed for LED chains and LED Filament light bulbs with ac supply. Using a special circuit the DDA4 is able to dim the LED chains from 100% to zero without any rest illumination. Light chains or Light tubes fitted with little classic light bulbs may also be used. The use of DDA4 assumes that the operation of the LED light chains or LED filament light bulbs requires no transformers or electronic power supplies. The DDA4 can show different states, power on, DMX512 signal and one LED per channel which shines proportional to the load output. DMX512 start address, test modes and the offset setup is made by three rotary code switches. A DIP switch is used to disable DMX-Hold and to exchange between two dimming offsets. The second offset value is programmable via the rotary code switches. 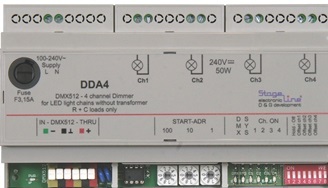 The DDA4 is part of our series of devices for installation in electrical installation cabinets.